This unique collection of Photoshop plug-ins has all that you may need to start creating fantastic graphically rich artwork right away. Among the professional effects included in this plug-in package are: Aqua, Chrome, Drop, Ice, Metal and Snow. Each effect is built on high precision mathematical model ensuring you get the greatest level of quality when applying effects. Artistic Effects is more than just a set of powerful fine art image effects. 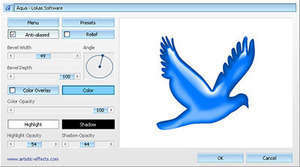 Artistic Effects 1.8 is a shareware program and can be used as a demo to try the software until the free trial period has ended. A full version of the program is available after the trial period ends. For security reasons, you should also check out the Artistic Effects download at LO4D.com which includes virus and malware tests. Additional screenshots of this application download may be available, too.